Many symptoms of hormonal imbalance such as weight gain, skin problems or hair loss are particularly delicate because they have a great influence in a woman's self esteem and body image. Hair, in particular, is traditionally regarded as one of the most important symbols of femininity. While hair loss is usually regarded as a masculine problem, a large amount of women experience hair loss during their lives, mostly because of hormonal imbalance. Fortunately, there are many ways to manage and to even treat female hair loss caused by hormonal problems. In order to understand why hair loss happens in women, the role hormones play in it and how to prevent it, please read the sections below. A little over 10% of women under 50 experience noticeable hair loss at some point of their lives - not counting pregnancy or postpartum. Up to 75% of women will experience hair loss or hair thinning after the age of 65. Among elderly women, hair thinning is as prevalent as among elderly men. It is well known that men commonly suffer from “male pattern baldness” or a progressively receding hairline with a bald spot on the top, which worsens as they age. However, female hair loss -medically termed female alopecia - doesn't usually get as much attention even if it's surprisingly common. Most of the time alopecia acts as a symptom of an underlying imbalance or hidden condition rather than as a disease by itself. The significant hormonal changes that take place during a woman's reproductive life (from puberty to menopause, including pregnancy and the post-partum period), especially the balance between testosterone and estrogen, are one of the most common hidden imbalances behind female hair loss. It is important then to see hair health as a mirror of the body's overall health, since many types of hormonal imbalance behind alopecia can eventually cause deeper health issues. Telogen phase is a resting period, where the hair stops growing completely. Normally, it lasts around 3 months. Once telogen phase is over, the old strand of hair will be pushed from the follicle by a new one. Under normal circumstances no more than 15% of the total scalp hair is undergoing telogen phase at any given time. This is why everybody loses approximately 150 hairs every day, and this should not be a cause of concern. There are several ways and patterns for female alopecia to present itself, and each one of them may have different causes or possible treatments. In order to understand the processes behind hair loss, continue on to the next section to read more about their hormonal and non-hormonal causes. One cause of sudden hair loss is traction alopecia. This refers to hair falling out because of stress on the follicles caused by tight hair styles such as a bun, a ponytail, or tight braids. To avoid this, try to wear your hair in a softer fashion. Read on for other causes of hair loss. Learning about the causes of hair loss provides the key to understanding how to prevent and treat this troublesome symptom. While the exact causes of hair loss are complex, most doctors and researchers point out that most of the time hormonal changes are the primary cause of hair loss. In addition to these completely normal hormonal causes, other factors and medical conditions can, in more rare instances, cause hair loss. 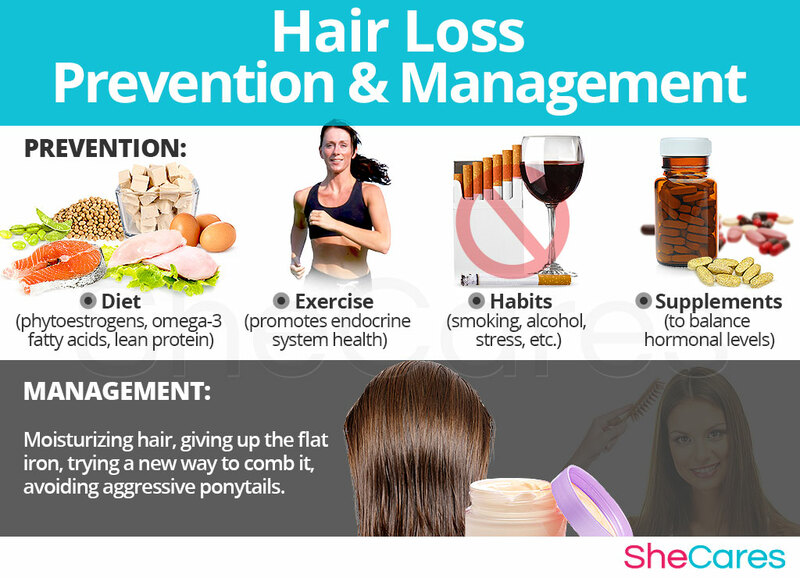 Continue reading to learn more about both the hormonal, and other, causes of hair loss. Hormones are chemical messengers that control every organ in the body, so when changes in these hormone levels occur, certain health disorder can arise. Medical researchers have found that fluctuating levels of hormones, especially estrogen and testosterone, make women more susceptible to experiencing hair loss at certain points of their reproductive life. 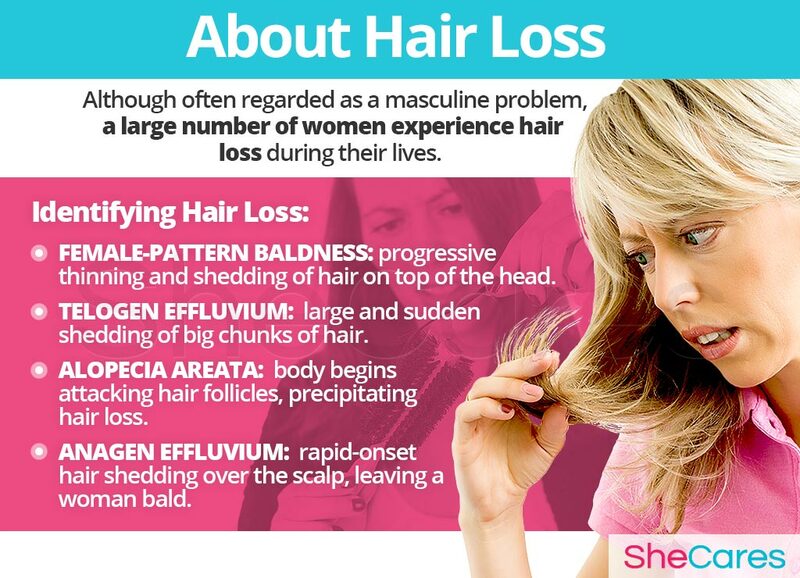 While androgenic alopecia is directly linked to an excessive amount of testosterone in a woman's body, the hormonal causes for telogen effluvium are linked mostly to estrogen and progesterone levels. 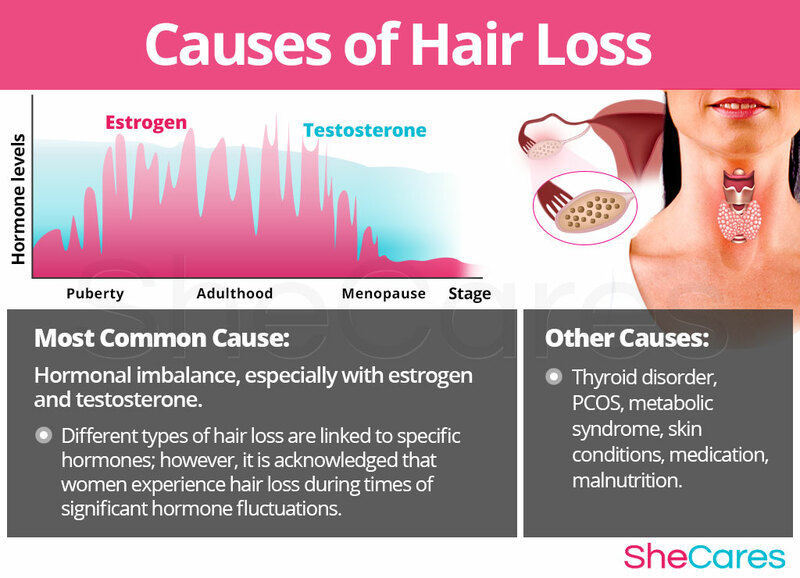 Low levels of estrogen or sharp fluctuations between estrogen and progesterone can push a large amount of hairs to enter telogen phase prematurely, and to start falling one or two months later. Hence the reason why more women experience hair loss during times of significant hormonal imbalance - puberty, PMS, menstruation, pregnancy, postpartum and menopause. These functions may become overactive or underactive as a result of too much or too little estrogen. If hormone and serotonin levels are not regulated, women may experience hair loss, as well as other psychological and physiological disturbances. Furthermore, there are also specific hormonal causes and typical environmental factors which can explain the occurrence of hair loss according to the stage of a women's reproductive life in which this disorder appears, such as around PMS and during puberty, pregnancy, post-partum, and menopause. While hormonal imbalance is the major underlying cause of mood swings during a woman's life, experts also point out that hair loss may be caused by other, less common, underlying conditions, including thyroid disorders, metabolic syndrome, or certain skin conditions. 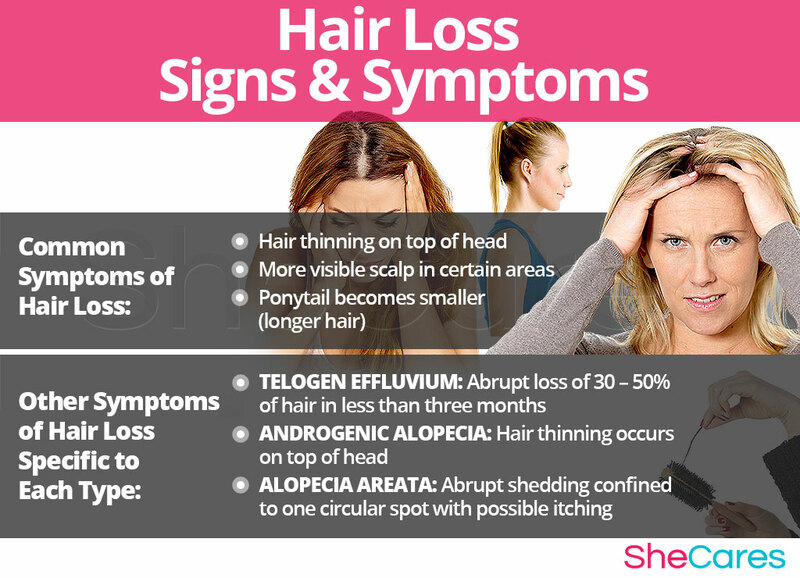 Keep reading to learn more about the risk factors for chronic, recurring hair loss, and the triggers for episodes of abrupt hair loss - especially telogen effluvium. Although it will only affect a small percentage of women, hair loss is a symptom of menopause that carries potentially grave emotional consequences. Some women are more likely than others to suffer from hair loss because of inherent psychological, behavioral, and health reasons - such as obesity, stress, or past emotional trauma. These predisposing factors can affect a woman's hormone levels and increase the chances of developing hair loss during her reproductive life. In addition to long term risk factors, hair loss - especially telogen effluvium - can be abruptly triggered by certain environmental factors or stressful events. 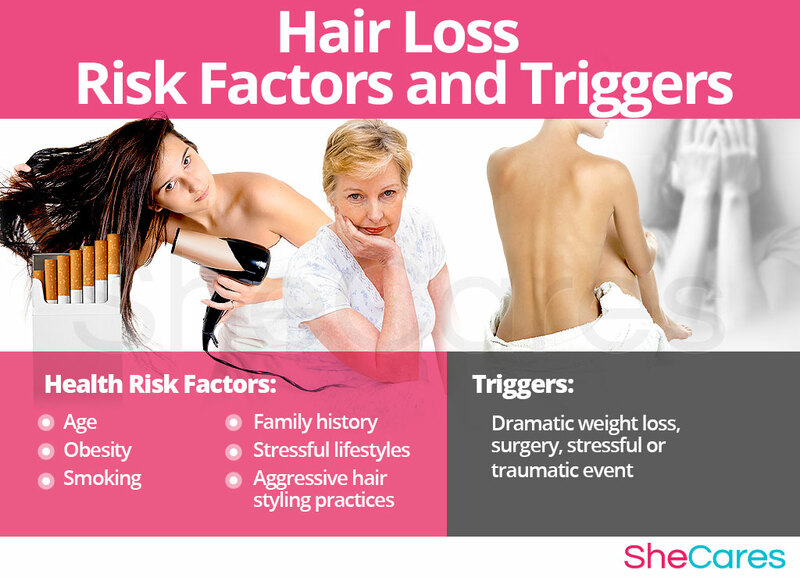 However, because hair usually remains in telogen phase for one to three months before being “expelled “ from the scalp by a new anagen hair, in order to identify these triggers many women need to draft their history up to three months back in order to identify what caused a massive amount of hair to enter telogen phase. Continue Reading to discover the symptoms and signs of hair loss to be able to choose a treatment specific to its cause. While it is normal to lose up to 100 hairs per day, when excessive hair loss occurs many women are able to notice it themselves, either by finding more hairs after washing it or combing it, or by noticing there is an unusual amount of hair left on their pillows. On the other hand, other women may be confused because they don't know if the amount of hair they are shedding is normal, precipitating anxiety. Hair thinning on top of the head. Scalp becomes more visible in certain areas, particularly the parting line. If the hair is long enough to be tied on a ponytail, it will become smaller or require a smaller elastic band. What other symptoms might occur with hair loss? In addition to these general indicators of hair loss, there are some symptoms that are specific to one type of hair loss and that can be used to identify it. To diagnose and identify these symptoms, the doctor usually must perform three procedures: a review of the patient's medical history, a physical exam, and a pull test. In some cases, if necessary, the doctor also may order some tests. 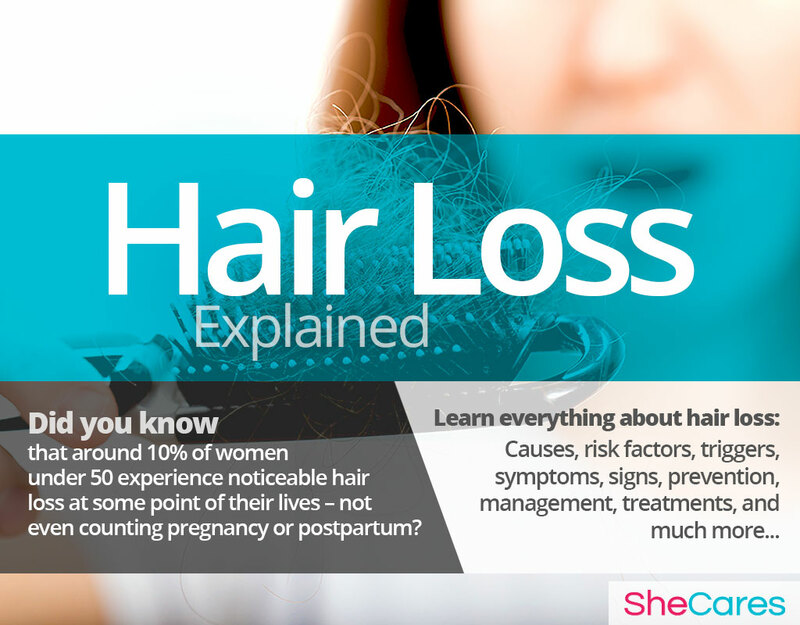 Women who experience hair loss may wish to treat it or learn how to prevent it. Keep reading below to learn useful techniques and habits that will prevent hair loss or make it more manageable. Taking vitamin supplements can be detrimental to your health if you end up consuming too much of one sort. Instead trichologists, dieticians suggest that you should merely ensure that you consume a healthy, balanced diet in order to gain an adequate amount from each food group. While there is no single way to completely prevent hair loss, just as there is no way to stave off natural hormonal processes, there are a few steps that a woman can take to lessen her chances of developing severe hair loss, or to minimize the frequency or intensity of her shedding. Lifestyle changes for prevention are extremely important, especially with regard to diet, exercise, and healthy habits. Moreover, women may seek ways to complement these lifestyle approaches with the use of supplements that help enhance the endocrine system and, therefore, help prevent or ease symptoms of hormonal imbalance such as hair loss. For women who have already gained weight, prevention may no longer be possible, but there are many ways to help manage the symptoms. Keep reading to learn about the different ways to manage hair loss. With practice and self control, some women can make any hair loss they are already experiencing be as unnoticeable and comfortable as possible. Making minor daily changes ad avoiding triggers can make a huge difference for women trying to manage or hide their hair loss. While these measures often help to reduce the intensity of hair loss or slow it down, they are unable to treat the root of the problem, which in most cases is hormonal imbalance. However, there are several natural treatments that can fix the hormonal causes of hair loss. Please continue to the next section to learn more about treating hair loss. Hair loss products for woman can be divided into pharmaceutical formulations and natural preparations. Each product has varying rates of success, and some may produce undesirable side effects. It is best to discuss hair loss products with your physician or pharmacist before deciding on one. To make matters more confusing, the sad fact is that there is a plethora of bogus products out there that claim to cure hair loss and guarantee the growth of a thick and luscious mane. Keep this in mind, and don't be deceived by anything that sounds too good to be true - it probably is. Women who face hair loss often find that it causes them anxiety, due to the unwanted change to their appearance. Considering this, the fact that stress can be a cause for hair loss can make things difficult because it can easily become a sort of vicious circle. Taking time to relax is therefore extremely important. For some women, there may be a point in their lives when experiencing some hair loss will be inevitable. Fortunately, because hair loss is usually a consequence of fluctuations in hormones such as estrogen, testosterone and progesterone, it is possible to treat this imbalance. Three levels of approaches can be considered for treating hair loss. These are categorized as: (1) Lifestyle Changes, (2) Alternative Medicine and (3) Pharmaceutical and Surgical Options. Women are encouraged to begin with the least risky approach to hair loss treatment, lifestyle adjustments, and then proceed to the next level of care. While medical intervention is not usually necessary to treat hair loss, some women who are unable to find relief from lifestyle changes and alternative medicine may wish to consider pharmaceutical or surgical options, after properly assessing the risks associated with such a treatment. This primary level of treatment for hair loss involves the least amount of risk, though conversely it requires the highest amount of self discipline. Often simple changes in lifestyle can reap huge benefits in fighting hair loss and achieving a higher overall level of health. Fundamentally, an improved diet, regular exercise, and healthy habits can do a woman a great service. While these changes will help alleviate hair loss, they do not directly address hormonal imbalance - the most common cause of hair loss in women - so further treatment may be necessary. Alternative medicine has proven to be an excellent way of treating hair loss when related to hormonal imbalance in a safe and natural way. These supplements, such as dong quai, contain estrogenic components produced by plants that complement the low estrogen hormones in a woman's body, helping diminish and treat hair loss. By introducing plant-based estrogens into the body, these herbs treat the underlying estrogen deficiency behind hair loss. They are mainly effective for menopausal women who are more likely to have low estrogen levels and experience androgenic alopecia but are not necessarily effective for women in other stages of life such as puberty, or for cases of telogen effluvium. 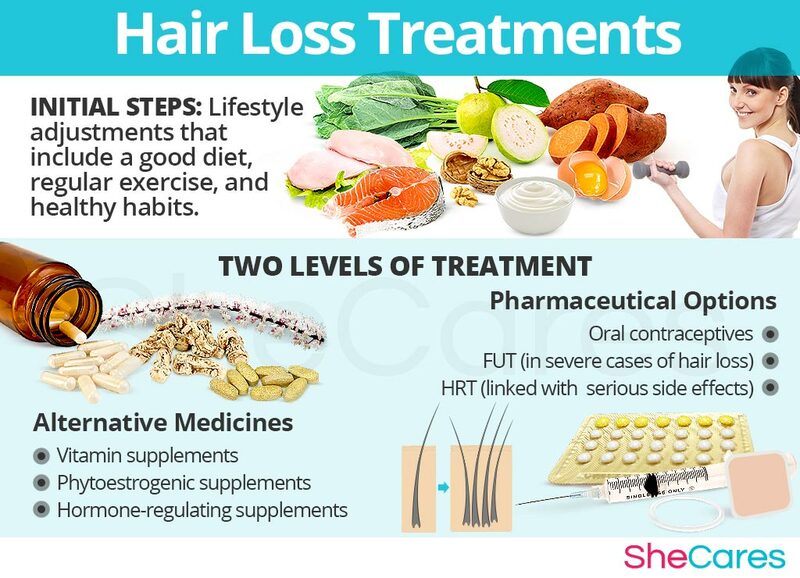 These supplements can be considered the safest and most natural way to treat the underlying hormonal imbalance behind hair loss, and can be taken throughout a woman's life, as they support the body's natural hormone production. Additionally, there are some other types of supplements that can also alleviate hair loss, or at least make it more manageable, including vitamin and other herbal supplements. A combination of approaches is usually the most effective route to take. Lifestyle changes combined with alternative medicine will most likely be the best way to stop and reverse hair loss. However, for some women the symptoms will be so severe that a more drastic treatment is necessary. Interventions at the third level involve the highest risk and often the highest costs. Not all treatments are suitable for women at every life stage, so it is strongly recommended to speak to a licensed healthcare practitioner before starting any pharmaceutical treatments for hair loss. There are two main types of medical options that can be prescribed to treat hair loss: hormone-regulating medication and follicular unit transplants. These three levels of approaches are not mutually exclusive. A woman may use different approaches at different times or any combination of them to treat hair loss, depending on the duration and severity of symptoms. Today more and more women find that dealing with hair loss is best accomplished via a combination of healthy lifestyle and alternative treatments. Arias-Santiago, S., Gutiérrez-Salmón, M., Castellote- Caballero, L., Buendía-Eisman, A., Naranjo-Sintes, R.et al. (2009). Androgenetic Alopecia and cardiovascular risk in women: A comparative study. Journal of the American Academy of Dermatology. Vol 63(3): 420-429.